Document groups, document sets, and individual documents can be renamed at any point. Simply right-click on any of these objects and select the appropriate entry from the context menu. It is not recommended that you have more than one document with the same name. It is possible, but it can be very confusing. 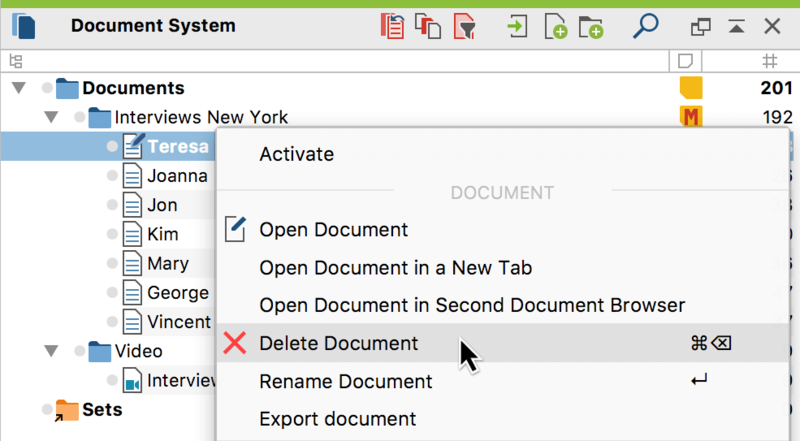 Right-clicking on documents opens the context menu, giving you the option Delete document, which also deletes the coded segments, memos, and links associated with it. In the context menu for a document group, you also have the Delete document group option, which deletes all the documents in a group in one single action.